Malone TC, Mennenga SE, Guss J, Podrebarak SK, Owens LT, Bossis AP, Belser AB, Agin-Liebes G, Bogenschutz MP, Ross S. Individual Experiences in Four Cancer Patients Following Psilocybin-Assisted Psychotherapy. (2018) Front Pharmacol. 2018; 9: 256. Published online 2018 Apr 3. doi: 10.3389/fphar.2018.00256. Grob CS, Danforth AL, Chopra GS, Hagerty M, McKay CR, Halberstadt AL, Greer GR. (2011) Pilot Study of Psilocybin Treatment for Anxiety in Patients With Advanced-Stage Cancer. Arch Gen Psychiatry. 2011;68(1):71-78. doi:10.1001/archgenpsychiatry.2010.116. Bogenschutz MP, Podrebarac SK, Duane JH, Amegadzie SS, Malone TC, Owens LT, Ross S, Mennenga SE. Clinical Interpretations of Patient Experience in a Trial of Psilocybin-Assisted Psychotherapy for Alcohol Use Disorder. (2018) Front. Pharmacol., 20 February 2018, p.100, doi.org/10.3389/fphar.2018.00100. Garcia-Romeu A, Griffiths RR, Johnson MW. Psilocybin-occasioned Mystical Experiences in the Treatment of Tobacco Addiction. Curr Drug Abuse Rev. 2015 Jan 7. [Epub ahead of print]. Bogenschutz MP, Forcehimes AA, Pommy JA, Wilcox CE, Barbosa P, Strassman RJ. Psilocybin-assisted treatment for alcohol dependence: A proof-of-concept study. J Psychopharmacol. 2015 Jan 13. pii: 0269881114565144. [Epub ahead of print]. Johnson MW, Garcia-Romeau A, Cosimano MP, Griffiths RR. (2014) Pilot study of the 5-HT2AR agonist psilocybin in the treatment of tobacco addiction. Journal of Psychopharmacology, Published online before print September 11, 2014, doi: 10.1177/0269881114548296. Krupitsky EM, Burakov AM, Dunaevsky IV, Romanova TN, Slavina TY, Grinenko AY. (2007) Single versus repeated sessions of ketamine-assisted psychotherapy for people with heroin dependence. J Psychoactive Drugs 2007 Mar;39(1):13-9. Moreno FA, Wiegand CB, Taitano EK, Delgado PL. (2006) Safety, tolerability, and efficacy of psilocybin in 9 patients with obsessive-compulsive disorder. J Clin Psychiatry 2006 Nov;67(11):1735-40. Doering-Silveira E, Grob CS, Dobkin de Rios M, Lopez E, Alonso LK, Tacla C, da Silveira DX. (2005) Report on psychoactive drug use among adolescents using ayahuasca within a religious context. J Psychoactive Drugs 37(2): 141-144. Krupitsky E, Burakov A, Romanova T, Dunaevsky I, Strassman R, Grinenko A (2002) Ketamine psychotherapy for heroin addiction: immediate effects and two-year follow-up. Journal of Substance Abuse Treatment 23(4):273-283. Griffiths RR, Hurwitz ES, Davis AK, Johnson MW, Jesse R. (2019) Survey of subjective “God encounter experiences”: Comparisons among naturally occurring experiences and those occasioned by the classic psychedelics psilocybin, LSD, ayahuasca, or DMT. PLoS ONE 14(4): e0214377. Barrett FS, Johnson MW, Griffiths RR. Validation of the revised Mystical Experience Questionnaire in experimental sessions with psilocybin. (2015) J Psychopharmacol. 2015 Nov;29(11):1182-90. doi: 10.1177/0269881115609019. Epub 2015 Oct 6. MacLean KA, Johnson MW, Leoutsakos JS, Griffiths RR. (2012) Factor Analysis of the Mystical Experience: A Study of Experiences Occasioned by the Hallucinogen Psilocybin. Journal for the Scientific Study of Religion, 51(4):721-737. Griffiths RR, Johnson MW, Richards WA, Richards BD, McCann U, Jesse R. (2011) Psilocybin occasioned mystical-type experiences: immediate and persisting dose-related effects. Psychopharmacology (Berl). 2011 Jun 15. [Epub ahead of print]. Griffiths RR, Richards WA, Johnson MW, McCann UD, Jesse R. (2008) Mystical-type experiences occasioned by psilocybin mediate the attribution of personal meaning and spiritual significance 14 months later. Journal of Psychopharmacology 2008 Aug;22(6):621-32. Carter OL, Presti DE, Callistemon C, Ungerer Y, Liu GB, Pettigrew JD. (2005) Meditation alters perceptual rivalry in Tibetan Buddhist monks. Curr Biol. 2005 Jun 7;15(11):R412-3. Preller KH, Pokorny T, Hock A, Kraehenmann R, Stämpfli P, Srifritz E, Vollenweider FX. Effects of serotonin 2A/1A receptor stimulation on social exclusion processing. (2018) PNAS May 3, 2016 113 (18) 5119-5124 [published ahead of print April 18, 2016]. Preller KH, Herdener M, Pokorny T, Planzer A, Kraehenmann R, Stämpfli P, Liechti ME, Seifritz E, Vollenweider FX. The Fabric of Meaning and Subjective Effects in LSD-Induced States Depend on Serotonin 2A Receptor Activation. (2017) Curr Biol. 2017 Feb 6;27(3):451-457. doi: 10.1016/j.cub.2016.12.030. Epub 2017 Jan 26. Martin DA, Nichols CD. Psychedelics Recruit Multiple Cellular Types and Produce Complex Transcriptional Responses Within the Brain. (2016) EBioMedicine. 2016 Sep;11:262-277. doi: 10.1016/j.ebiom.2016.08.049. Epub 2016 Sep 3. Garcia-Romeu A, Kersgaard B, Addy PH. Clinical Applications of Hallucinogens: A Review (2017) Exp Clin Psychopharmacol. 2016 Aug; 24(4): 229–268. Preller KH, Pokorny T, Hock A, Kraehenmann R, Stämpfli P, Seifritz E, Scheidegger M, Vollenweider FX. Effects of serotonin 2A/1A receptor stimulation on social exclusion processing. (2016) Proc Natl Acad Sci U S A. May 3;113(18):5119-24. doi: 10.1073/pnas.1524187113. Epub 2016 Apr 18. Pokorny T, Preller KH, Kraehenmann R, Vollenweider FX. Modulatory effect of the 5-HT1A agonist buspirone and the mixed non-hallucinogenic 5-HT1A/2A agonist ergotamine on psilocybin-induced psychedelic experience. (2016) Eur Neuropsychopharmacol. Apr;26(4):756-66. doi: 0.1016/j.euroneuro.2016.01.005. Epub 2016 Jan 22. Kraehenmann R, Schmidt A, Friston K, Preller KH, Seifritz E, Vollenweider FX. The mixed serotonin receptor agonist psilocybin reduces threat-induced modulation of amygdala connectivity. (2015) Neuroimage Clin. Aug 22;11:53-60. doi: 10.1016/j.nicl.2015.08.009. eCollection 2016. Kometer M, Pokorny T, Seifritz E, Volleinweider FX. Psilocybin-induced spiritual experiences and insightfulness are associated with synchronization of neuronal oscillations. (2015) Psychopharmacology (Berl). Oct;232(19):3663-76. doi: 10.1007/s00213-015-4026-7. Epub 2015 Aug 1. Bernasconi F, Kometer M, Pokorny T, Seifritz E, Vollenweider FX. The electrophysiological effects of the serotonin 1A receptor agonist buspirone in emotional face processing. Eur Neuropsychopharmacol. 2015 Jan 17. pii: S0924-977X(15)00010-3. doi: 10.1016/j.euroneuro.2015.01.009. [Epub ahead of print]. Nau F, Miller J, Saravia J, Ahlert T, Yu B, Happel KI, Cormier SA, Nichols CD. Serotonin 5-HT2 receptor activation prevents allergic asthma in a mouse model. Am J Physiol Lung Cell Mol Physiol 308: L191–L198, 2015. Kraehenmann R, Preller KH, Scheidegger M, Pokorny T, Bosch OG, Seifritz E, Vollenweider FX. Psilocybin-Induced Decrease in Amygdala Reactivity Correlates with Enhanced Positive Mood in Healthy Volunteers. Biological Psychiatry, 2014 Apr 26. pii: S0006-3223(14)00275-3. doi: 10.1016/j.biopsych.2014.04.010. [Epub ahead of print]. Kometer M, Schmidt A, Jäncke L, Vollenweider FX. Activation of serotonin 2A receptors underlies the psilocybin-induced effects on α oscillations, N170 visual-evoked potentials, and visual hallucinations. Journal of Neuroscience, 2013 Jun 19;33(25):10544-51. Studerus E, Gamma A, Kometer M & Vollenweider FX. (2012) Prediction of Psilocybin Response in Healthy Volunteers. PLoS One. 2012; 7(2): e30800. Carhart-Harris RL, Leech R, Williams TM, Erritzoe D, Abbasi N, Bargiotas T, Hobden P, Sharp DJ, Evans J, Feilding A, Wise RG, Nutt DJ. (2012) Implications for psychedelic-assisted psychotherapy: a functional magnetic resonance imaging study with psilocybin. Br J Psychiatry. 2012 Jan 26. [Epub ahead of print]. Carhart-Harris RL, Erritzoe D, Williams T, Stone JM, Reed LJ, Colasanti A, Tyacke RJ, Leech R, Malizia AL, Murphy K, Hobden P, Evans J, Feilding A, Wise RG, Nutt DJ. (2012) Neural correlates of the psychedelic state as determined by fMRI studies with psilocybin. PNAS 2012; published ahead of print January 23, 2012, doi:10.1073/pnas.1119598109. Studerus E, Kometer M, Hasler F, Vollenweider FX. (2011) Acute, subacute and long-term subjective effects of psilocybin in healthy humans: a pooled analysis of experimental studies. J Psychopharmacol November 2011 vol. 25 no. 11 1434-1452. Quednow BB, Kometer M, Geyer MA, Vollenweider FX. (2011) Psilocybin-Induced Deficits in Automatic and Controlled Inhibition are Attenuated by Ketanserin in Healthy Human Volunteers. Neuropsychopharmacology. 2012 Feb;37(3):630-40. doi: 10.1038/npp.2011.228. Epub 2011 Sep 28. Kometer M, Cahn BR, Andel D, Carter OL, Vollenweider FX. (2011) The 5-HT2A/1A agonist psilocybin disrupts modal object completion associated with visual hallucinations. Biol Psychiatry. 2011 Mar 1;69(5):399-406. Epub 2010 Dec 3. Vollenweider FX, Kometer M. (2010) The neurobiology of psychedelic drugs: implications for the treatment of mood disorders. Nature Reviews Neuroscience 11, 642-651 (September 2010) | doi:10.1038/nrn2884. Hysek CM, Vollenweider FX, Liechti ME. (2010) Effects of a β-blocker on the cardiovascular response to MDMA (Ecstasy). Emerg Med J doi:10.1136/emj.2009.079905, published online April 8, 2010. Hasler F, Kuznetsova OF, Krasikova RN, Cservenyak T, Quednow BB, Vollenweider FX, Ametamy SM, Westera G. (2009) GMP-compliant radiosynthesis of [18F]altanserin and human plasma metabolite studies. Applied Radiation and Isotopes 2009 Apr;67(4):598-601. Geyer MA, Vollenweider FX. (2008) Serotonin research: contributions to understanding psychoses. Trends in Pharmacological Sciences 2008 Sep;29(9):445-53. Johnson MW, Richards WA, Griffiths RR. (2008) Human hallucinogen research: guidelines for safety. Journal of Psychopharmacology 2008 Aug;22(6):603-20. Wackermann J,Wittmann M, Hasler F,Vollenweider FX. (2008) Effects of varied doses of psilocybin on time interval reproduction in human subjects. Neurosci. Lett. 435:51–55. Wittmann M, Carter O, Hasler F, Cahn R, Grimberg U, Spring P, Hell D, Flohr H, Vollenweider F. (2007) Effects of psilocybin on time perception and temporal control of behaviour in humans. J Psychopharm 2007 Jan;21(1):50-64. Braden MR, Parrish JC, Naylor JC, Nichols DE. (2006) Molecular interaction of serotonin 5 HT2A receptor residues Phe339(6.51) and Phe340(6.52) with super-potent N-benzyl phenethylamine agonists. Mol Pharmacol 70:1956–1964. Parrish JC, Nichols DE. (2006) Serotonin 5-HT receptor activation induces 2-arachidonoylglycerol release through a phospholipase c-dependent mechanism. J Neurochem 2006 Nov;99(4):1164-75. McLean TH, Chambers JJ, Parrish JC, Braden MR, Marona-Lewicka D, Kurrasch-Orbaugh D, Nichols DE. (2006) C-(4,5,6-trimethoxyindan-1-yl)methanamine: a mescaline analogue designed using a homology model of the 5-HT2A receptor. J Med Chem. 49(14):4269-74. Carter OL, Burr DC, Pettigrew JD, Wallis GM, Hasler F, Vollenweider FX. (2005) Using psilocybin to investigate the relationship between attention, working memory, and the serotonin 1A and 2A Receptors. J Cognitive Neuroscience 17(10): 1497–1508. Gamma A, Brandeis D, Brandeis R, Vollenweider FX. (2005) The P3 in ‘ecstasy’ polydrug users during response inhibition and execution. J Psychopharmacol. 19(5):504-12. Vollenweider FX, Liechti ME, Paulus MP. (2005) MDMA affects both error-rate dependent and independent aspects of decision-making in a two-choice prediction task. J Psychopharmacol 19(4):366-374. Carter OL, Pettigrew JD, Hasler F, Wallis GM, Liu GB, Hell D, Vollenweider FX. Modulating the rate and rhythmicity of perceptual rivalry alternations with the mixed 5-HT2A and 5-HT1A agonist psilocybin. Neuropsychopharmacology. 2005 Jun;30(6):1154-62. Halpern JH, Sherwood AR, Hudson JI, Yurgelun-Todd D, Pope HG. (2005) Psychological and cognitive effects of long-term peyote use among Native Americans. Biol Psychiatry 58:624–631. Doering-Silveira E, Lopez E, Grob CS, Dobkin de Rios M, Alonso LK, Tacla C, Shirakawa I, Bertolucci PH, da Silveira DX. (2005) Ayahuasca in adolescence: a neuropsychological assessment. J Psychoactive Drugs 37(2): 123-128.
da Silveira DX, Grob CS, Dobkin de Rios M, Lopez E, Alonso LK, Tacla C, Doering-Silveira E. (2005) Ayahuasca in adolescence: a preliminary psychiatric assessment. J Psychoactive Drugs 37(2): 129-133. Dobkin de Rios M, Grob CS, Lopez E, da Silveira DX, Alonso LK, Doering-Silveira E. (2005) Ayahuasca in adolescence: qualitative results. J Psychoactive Drugs 37(2): 135-139. Carter OL, Pettigrew JD, Burr DC, Alais D, Hasler F, Vollenweider FX. (2004) Psilocybin impairs high-level but not low-level motion perception. Neuroreport Aug 26;15(12):1947-1951. Nichols CD, Sanders-Bush E. (2004) Molecular genetic responses to lysergic acid diethylamide include transcriptional activation of MAP kinase phosphatase-1, C/EBP-beta and ILAD-1, a novel gene with homology to arrestins. J. Neurochem. Aug;90(3):576-84. Hasler F, Grimberg U, Benz MA, Huber T, Vollenweider FX. (2004) Acute psychological and physiological effects of psilocybin in healthy humans: a double-blind, placebo-controlled dose-effect study. Psychopharmacology 172:145-156. Gamma A, Lehmann D, Frei E, Iwata K, Pascual-Marqui RD, Vollenweider FX. (2004) Comparison of Simultaneously Recorded [H2(15)O]-PET and LORETA During Cognitive and Pharmacological Activation. Human Brain Mapping 22:83-96. Nichols CD, Garcia EE and Sanders-Bush E (2003) Dynamic changes in prefrontal cortex gene expression following lysergic acid diethylamide administration.nMolecular Brain Research 111:182–188. Umbricht D, Vollenweider FX, Schmid L, Grübel C, Skrabo A, Huber T and Koller R (2003) Effects of the 5-HT2A Agonist Psilocybin on Mismatch Negativity Generation and AX-Continuous Performance Task: Implications for the Neuropharmacology of Cognitive Deficits in Schizophrenia Neuropsychopharmacology 28:170–181. Halpern JH and Pope HG (2003) Hallucinogen persisting perception disorder: what do we know after 50 years? Drug and Alcohol Dependence 69:109-119. Kurrasch-Orbaugh DM, Watts VJ, Barker EL, and Nichols DE (2003) Serotonin 5-HT 2A receptor-coupled phospholipase C and phospholipase A 2signaling pathways have different receptor reserves. J. Pharmacol. Exp. Ther. 304:229-237. Chambers J and Nichols DE (2002) A homology-based model of the human 5-HT 2A receptor derived from an in silico activated G-protein coupled receptor. J. Computer-Aided Molecular Design 16:511-520. Whiteside MS, Kurrasch-Orbaugh D, Marona-Lewicka D, Nichols DE & Monte A. (2002) Substituted hexahydrobenzodipyrans as 5-HT2A/2C receptor probes. Bioorg Med Chem. 2002 Oct;10(10):3301-6. Nichols DE et al. (2002) Lysergamides of isomeric 2,4-dimethylazetidines map the binding orientation of the diethylamide moiety in the potent hallucinogenic agent N,N-diethyllysergamide. J Med Chem. 2002 Sep 12;45(19):4344-9. Vollenweider FX (2002) Brain mechanisms of hallucinogens and entactogens. Dialogues in Clinical Neuroscience, Vol 3, No. 5, pp. 265-279. Vollenweider FX & Geyer MA (2001) A systems model of altered consciousness: Integrating natural and drug-induced psychoses. Brain Research Bulletin, Vol. 56, No. 5, pp. 495–507. Vollenweider FX, Liechti ME, Gamma A, Greer G, Geyer M. (2002) Acute psychological and neurophysiological effects of MDMA in humans. J Psychoactive Drugs. 2002 Apr-Jun;34(2):171-84. J.J. Chambers, D.M. Kurrasch-Orbaugh, M.A. Parker, and D.E. Nichols. (2001) “Enantioselective Synthesis and Pharmacological Evaluation of a Series of Super-Potent, Conformationally Restricted 5-HT2A/2C Receptor Agonists.” J. Med. Chem., 44, 1003-1010. U. Laban, D. Kurrasch-Orbaugh, D. Marona-Lewicka, and D.E. Nichols. (2001) “A novel fluorinated tryptamine with highly potent and selective serotonin 5-HT1A receptor agonist properties,” Bioorg. Med. Chem. Letters, 11, 793-795. Liechti ME, Gamma A, Vollenweider FX (2001) Gender differences in the subjective effects of MDMA. Psychopharmacology 154:161–168. Liechti, M. E. and Vollenweider, F. X. (2001) Which neuroreceptors mediate the subjective effects of MDMA in humans? A summary of mechanistic studies. Neuropsychobiology, Hum Psychopharmacol Clin Exp: 16:589-598. Liechti ME, Geyer MA, Hell D, Vollenweider FX (2001) Effects of MDMA (Ecstasy) on prepulse inhibition and habituation of startle in humans after pretreatment with citalopram, haloperidol, or ketanserin. Neuropsychopharmacology 24(3):240-252. Gamma A, Liechti ME, Vollenweider FX (2001) Giving MDMA to Human Volunteers in Switzerland. In: Holland J (ed) Ecstasy: The complete guide. A comprehensive look at the risks and benefits of MDMA. Park Street Press, Rochester, pp 327-337. Halpern, JH, Pope, HG. (2001) Hallucinogens on the internet: a vast new source of underground drug information. Am J Psychiatry 158: 481-483. Frei E, Gamma A, Pascual-Marqui R, Lehmann D, Hell D, Vollenweider FX. (2001) Localization of MDMA-Induced Brain Activity in Healthy Volunteers Using Low Resolution Brain Electromagnetic Tomography (LORETA). Human Brain Mapping 14:152–165. Blair JB, Kurrasch-Orbaugh D, Marona-Lewicka D, Cumbay MG, Watts VJ, Barker EL, and Nichols DE. (2000) Effect of Ring Fluorination on thePharmacology of Hallucinogenic Tryptamines. J. Med. Chem., 43, 4701-4710. Buck A, Gucker PM, Schönbächler RD, Arigone M, Kneifel S, Vollenweider FX, Ametamey SM, Burger, C. (2000) Evaluation of serotonergic transporters using PET and [11C](+)McN-5652: assessment of methods. Journal of Cerebral Blood Flow and Metabolism 20:253-262. Liechti ME, Baumann C, Gamma A, Vollenweider FX, (2000) Acute psychological effects of 3,4-methylenedioxymethamphetamine (MDMA, “Ecstasy”) are attenuated by the serotonin uptake inhibitor citalopram. Neuropsychopharmacology 22: 513-521. Liechti ME, Saur M, Gamma A, Hell D, Vollenweider FX (2000) Psychological and physiological effects of MDMA (“Ecstasy”) after pretreatment with the 5-HT2 antagonist ketanserin in healthy humans. Neuropsychopharmacology 23(4):396-405. 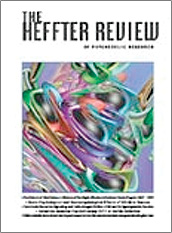 Liechti ME and Vollenweider FX (2000) Acute psychological and physiological effects of MDMA (“Ecstasy“) after haloperidol pretreatment in normal healthy humans. European Neuropsychopharmacology 10:289-295. Liechti ME, Vollenweider FX (2000) The serotonin uptake inhibitor citalopram reduces acute cardiovascular and vegetative effects of 3,4-methylenedioxymethamphetamine (‘Ecstasy’) in healthy volunteers. J. Psychopharmacology 14(3):269-274. Gamma A, Buck A, Berthold T, Hell D, Vollenweider FX. (2000) 3,4-methylenedioxymethamphetamine (MDMA) modulates cortical and limbic brain activity as measured by [H215O]-pet in healthy humans. Neuropsychopharmacology 23(4):388-395. Gamma A, Frei E, Lehmann D, Pascual-Marqui RD, Hell D, Vollenweider FX. (2000) Mood state and brain electric activity in Ecstasy users. Neuroreport 11(1): 157-162. Callaway JC, McKenna DJ, Grob CS, Brito GS, Raymon LP, Poland RE, Andrade EN, Mash DC. (1999) Pharmacokinetics of Hoasca alkaloids in healthy humans. J Ethnopharmacology 65:243-256. Lebot V, Johnston E, Zheng QY, McKern D, McKenna DJ. (1999) Morphological, phytochemical, and genetic variation in Hawaiian cultivars of ‘Awa (kava, piper methysticum, piperaceae). Economic Botany 53(4): 407-418. Vollenweider FX, Remensberger S, Hell D, Geyer MA. (1999) Opposite effects of 3,4-methylenedioxymethamphetamine (MDMA) on sensorimotor gating in rats versus healthy humans. Psychopharmacology 143:365-372. Halpern, JH, Pope, HG. (1998) Do hallucinogens cause residual neuropsychological toxicity? Drug and Alcohol Dependence 53: 247-256. 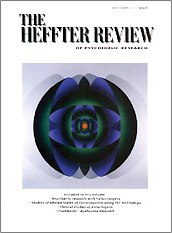 What is the Heffter Research Institute? Psychiatric Research with Hallucinogens: What have we learned? Why Study Hallucinogenic Drugs in Animals? Are The “Entactogens” a Distinct Psychoactive Substance Class? E. Gouzoulis-Mayfrank, M.D. and Leo Hermle, M.D. Evgeny M. Krupitsky, M.D., Ph.D. and A. Ya. Grinenko, M.D., Ph.D.
Dennis J. McKenna, Ph.D., J.C. Callaway, Ph.D and Charles S. Grob, M.D. .